The reborn Chevrolet Colorado offers plenty of truck utility, the comfort of a car and plenty of modern features and technology without a mind-spinning range of features and options or price tag. The 2015 Chevrolet Colorado returns after a 3-year hiatus, and it arrives in grand style, nabbing Motor Trend’s 2015 Truck of the Year award in spite of some tough competition. The days of bigger is better may be fading, as this midsize truck gives buyers a more affordable and more manageable truck option with modern styling, safety and plenty of technology. The midsize pickup market has been shrinking, and the Colorado was a victim, but Chevrolet has reconsidered, and the truck is back in the U.S. after a 3-year absence with several different configurations and a new look. It does not boast the mind-boggling number of variants of the larger full-size pickups, which makes figuring out which one to buy a lot easier. There are four trim levels, starting with the Base and moving up to the WT, LT and Z71. The Base is available only with an Extended cab and a 6-foot-2-inch long box, 6-speed manual transmission with rear-wheel drive (RWD), and a 2.5-liter, 4-cylinder engine with 200 hp and 191 lb-ft of torque. This gets you into a Colorado for $20,120 and is the bargain of the lot. The three remaining trims are available with an Extended cab and the long box or with a Crew cab with either a 5-foot-2-inch short box or the long box. They also all come with a choice of RWD or 4WD and an optional 3.6-liter, direct-injected V6 engine. Those opting for a WT can choose from a 6-speed manual or 6-speed automatic, while the LT and Z71 trims are available only as automatics. The Base includes a good range of amenities for a truck priced less than many cars. Standard features include 4-wheel antilock disc brakes, StabiliTrak electronic stability control with traction control, halogen headlamps with daytime running lamps, a rear-view camera, AM/FM stereo with a 4.2-inch color display, USB port, auxiliary input jack, 6-speaker sound system and a 4-way power driver’s seat. Move up to the WT and the biggest changes are the optional 3.6-liter V6 and a choice of either a 6-speed manual or 6-speed automatic depending on the body style. The LT gets rid of the manual-transmission option, but adds lots of comfort and convenience features. OnStar is free for the first 6 months, as is SiriusXM satellite radio for the first 3 months. 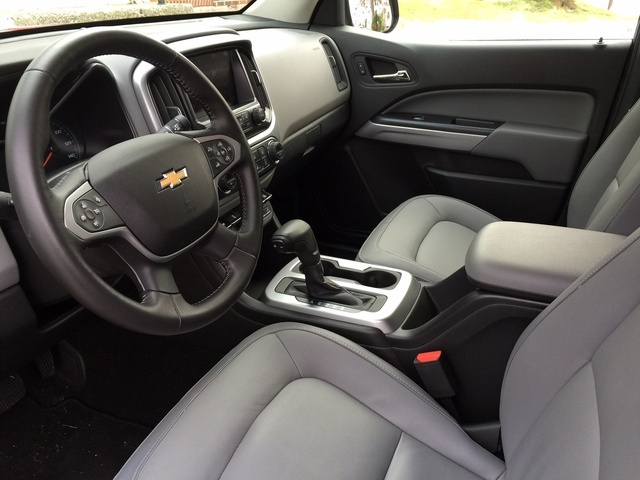 Chevrolet MyLink with an 8-inch color touchscreen, Bluetooth wireless connectivity, a leather-wrapped steering wheel with audio controls and Onstar 4G LTE capability are also part of this trim. The top trim is the Z71, which adds more in the way of utility. It gets a Z71 off-road suspension package, automatic locking rear differential, transfer shield case for 4WD variants, hill descent control, front recovery hooks, projector-beam headlamps and fog lamps. The Z71 also gets an EZ Lift-and-Lower tailgate, 17-inch Dark Argent Metallic-painted cast-aluminum wheels, single-zone automatic climate control, remote start, 4-way power driver's and front passenger seats with power lumbar control and an electric rear-window defogger. This is your fully loaded Colorado, and as a 4WD it starts at $34,115, keeping it nicely affordable. As a midsize truck, the Chevrolet Colorado manages to still look and feel big. In fact, you don’t really notice that it’s not a full-size pickup until you see it parked next to one. That’s when its smaller, more manageable proportions become noticeable. 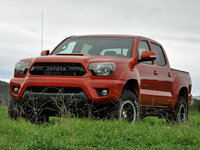 The truck definitely has presence and looks tough despite its technically smaller size. It might be, in some ways, a mini-Silverado, but it does not look like one. The grille is distinctive and refined with a chrome or very nice gunmetal finish with the Chevrolet bow tie front and center. Inside the story is similar, with an expansive amount of space that will leave no one feeling crowded. It’s updated and more modern-looking, with plenty of soft-touch surfaces that make it comfortable but not fussy. This is a truck, and it will likely be doing work, so you don’t want an interior that’s afraid to get dirty. The Colorado offers simplified comfort that doesn’t coddle and has plenty of storage space for whatever you’ve got in your pockets when you hop into the cab. My test Chevrolet Colorado was a rich Red Rock Metallic in the 4WD LT Crew cab with a long box that included options like a $500 Bose premium audio system, 18-inch Dark Argent wheels for $1,000, leather seats for $950, and safety and convenience features that bumped the price up to $38,870. My tester came with the optional 3.6-liter V6 with 305 hp and 269 lb-ft of torque that proved more than capable of powering the Colorado along the highway, and it did so very quietly. The lack of intrusive road, wind and engine noise is due to things like triple-sealed doors and the liberal use of sound-deadening materials. It makes a big difference and turns the ride into something more reminiscent of a car than a pickup. Sixth gear does seem to come on pretty quick, but you still have the power you need when you hit the pedal and force it to shift down a gear. It doesn’t hesitate to respond, making it easy to manage highway speeds and merging traffic. The ride is consistently smooth and well-mannered at all speeds, with very little of the bounce and sway that typically accompanies a truck. Steering, too was well-weighted and effortless. This is not a small car, this is a truck, but steering it could easily make you think it was a car, as it handles so nicely. Maneuvering through tight spaces and into narrow parking spots was a breeze, highlighting one of the benefits of driving a midsize over a full-size pickup. This truck is easily a daily driver, not just a workhorse made for construction sites and open fields. Despite being a midsize truck, the Colorado is still plenty capable. The V6 has a 3.42:1 final drive gear ratio and comes with a 1,520-pound payload capacity and 3,500 pounds of towing power that can be doubled to 7,000 pounds with the addition of a $250 Trailering Equipment Package. This adds just a receiver and wiring harness and is very much worth the price. Fuel-economy ratings add to the Colorado’s appeal, with 17 mpg city/24 highway/20 combined making it a very fuel-efficient midsize truck. I came in at just about average with 20.2 during a week that was mostly city driving, so those numbers are supported by real-world evidence. A midsize truck is for a driver with a different set of needs than the one who purchases a full-size pickup, and the Colorado shows off exactly why, for the right buyer, bigger is not better. It provides plenty of towing capability while still being just the right size for driving around town with nothing but some groceries and the kids along for the ride. There is room for 5 with comfortable rear seats that leave plenty of space to spread out, unless you’re using that middle seat, and then things do get somewhat squished. 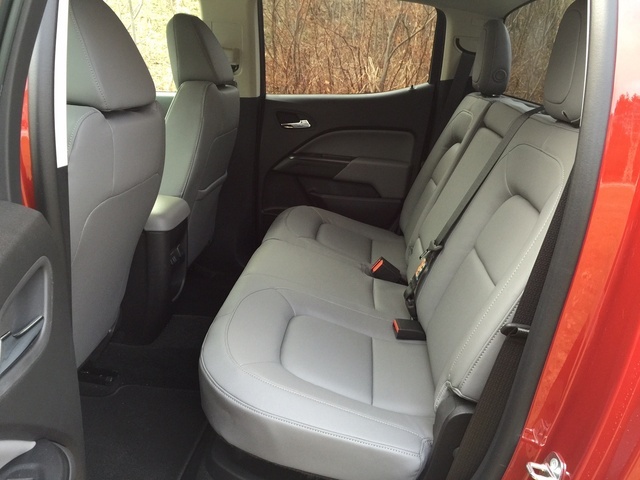 Headroom and legroom are ample, so even the 6-foot-plus set won’t feel cramped. The front bucket seats are even more comfortable and will be where everyone will want to sit on any kind of road trip. Those front seats are leather and heated with the addition of the Luxury Package, and they're fantastic on cold winter mornings. The interior overall isn’t luxurious, but it isn’t stingy and cheap either. It leans more toward utilitarian, especially for those sitting in the back. Up front there are soft-touch surfaces for resting your elbows, but nothing plush or overly fancy. Storage cubbies abound, with a deep center storage compartment under the armrest and two small storage areas in front of and behind the cupholders. The doors also get two storage pockets each, so there is no shortage of places to put your stuff. Controls are all well-placed and within easy reach. Knobs and buttons are also large, making them easy to grab with work gloves. Integrated audio controls on the steering wheel are soft-touch buttons that can be a little tricky with gloves, but the console controls are easy enough to reach. Loading the truck is easier thanks to a rear bumper with an integrated corner step that makes reaching inside much less of a stretch. It also makes hopping into the bed easier, even with the tailgate up, if you just want to step over the sides, which are high. A lighted cargo box and a locking tailgate are also standard features. An optional EZ Lift-and-Lower tailgate makes it easy to open with just one hand and adds a damper, so you can let go and it won’t slam open. This feature is particularly nice if your hands are full and you just want to release the tailgate and let it go, rather than standing there juggling whatever you’re carrying in just one arm. 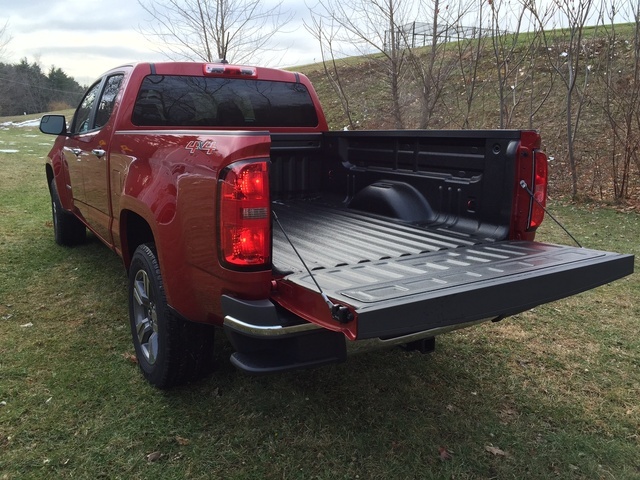 There are 13 standard tie-down spots in the truck bed to provide plenty of flexibility for securing cargo and a factory-installed spray-in bed liner to keep you from destroying that bed the first time you load it up. Optional moveable tie-down rings are also available for those who want the most complete range of options for oddly shaped cargo. 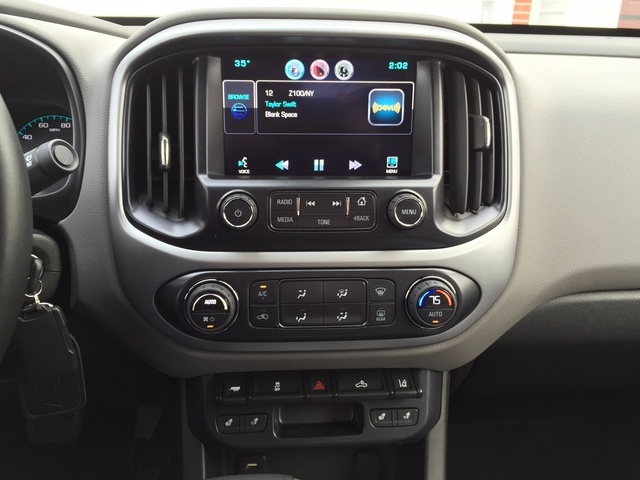 The Colorado LT comes standard with Chevrolet MyLink Radio that features an 8-inch color touchscreen, a 3-month subscription to SiriusXM Satellite Radio, a 6-month subscription to the OnStar Directions and Connections Plan, and a 5-year subscription to the OnStar Basic Plan. Directions and Connections give you automatic crash response, stolen vehicle assistance, roadside assistance and turn-by-turn navigation. The Basic Plan gives just RemoteLink key-fob services, vehicle diagnostics and dealer maintenance notifications. Both are available for a fee once their trials expire. The touchscreen is easy to reach, doesn’t suffer from glare issues that make it unreadable, and responds well to touch so you aren’t frustrated by a system that doesn’t do what you want on the first try. The MyLink system is one that is simple to use with features and settings that are easy to find. It’s intuitive enough that even without cracking open a manual or a dealer demo, drivers will quickly figure out how to customize the settings to their liking and easily find what they want in the system. The Colorado's Bluetooth wireless technology works with most phones, and MyLink also supports Siri Eyes Free and includes text messaging. This helps keep everyone safer, with the system reading messages aloud and letting the driver respond, all without taking eyes off the road. Those with compatible iPhones from 4S on up can access Siri via steering-wheel-mounted controls. This provides easy and safe access to calendars, text messages, calls and music streaming. Select MP3 players are also accessible through voice commands for streaming media, and there are two USB ports for plugging in devices. Two additional USB ports can be found on the back of the center console for charging. OnStar features 4G LTE connectivity, which includes a built-in mobile hotspot. This hotspot doesn’t need to be turned on, but simply activates whenever the vehicle is on and includes its own free trial of either 3 months or 3 gigabytes, whichever happens first. The 2015 Chevrolet Colorado had yet to be rated by the National Highway Transportation Safety Administration (NHTSA) or the Insurance Institute for Highway Safety (IIHS) at the time of this review, so crash test ratings were unavailable. Standard safety features include 4-wheel antilock disc brakes, airbags including side head curtains and StabiliTrak stability control with traction control. There are also some segment firsts for the Colorado, with a standard rear-vision camera and available forward-collision alert and lane-departure warnings. These physical safety features work hand-in-hand with those that are provided by OnStar. After the first 6 months, the Directions and Connections portion of the OnStar service is available only with a monthly fee, but it's worth considering for its potential to help during a crash. You’ll get automatic crash response, stolen-vehicle assistance and roadside assistance that can make sure you get the help you need even if you’re not capable of making the call. That additional level of safety and security will be especially appealing to those with younger drivers or who live in more rural areas, where help might not be so readily available. Midsize trucks offer a more affordable option for those who want the utility of a pickup, but don’t need or want a full-size truck parked in their driveway. The size of those larger trucks may just be too big for some, but it’s often a matter of price, since they do come at a premium. 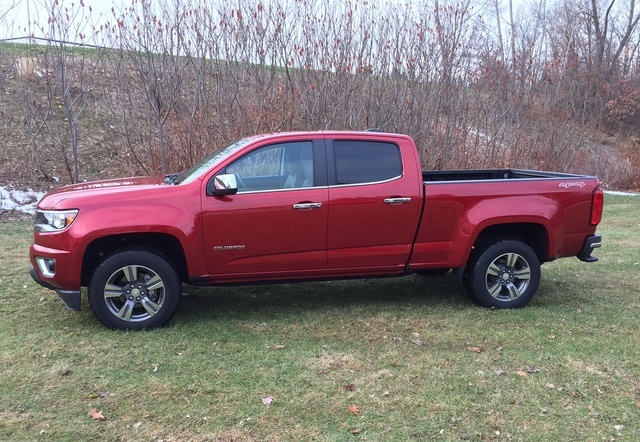 That makes the 2015 Chevrolet Colorado a cost-effective option. The Base model starts at a very modest $20,120. That will give you a truck that can haul your boat, carry the family on a weekend road trip and just as easily drive you to the office for only a smidge over $20,000. Budget-minded truck fans, this is your truck. Even moving up the scale to the more feature-laden LT and Z71 trim levels keeps things much more affordable than a large truck. Our well-equipped 4WD LT Crew cab with long box included comfort and convenience features galore and still came in under the $40,000 mark. The Colorado offers the utility of a truck and the comfort of a car without an eye-widening price tag. In addition to coming in with a lower sticker than bigger trucks, it also gets better fuel economy, which will keep even more of your cash in your wallet. Fuel-economy numbers lead the segment with a 27 mpg highway rating for 2.5-liter RWD models and a 26 mpg highway rating for 3.6-liter RWD models. Our tester rates only slightly less with a 17/24 rating, which still makes it a solid choice for a fuel-efficient truck. Warranty coverage includes 2-year/24,000-mile scheduled maintenance, a 3-year/36,000-mile bumper-to-bumper warranty, 3-year/36,000-mile corrosion warranty, 6-year/100,000-mile Rust-Through Warranty, 5-year/100,000-mile limited powertrain warranty and 5-year/100,000-mile roadside assistance and transportation. 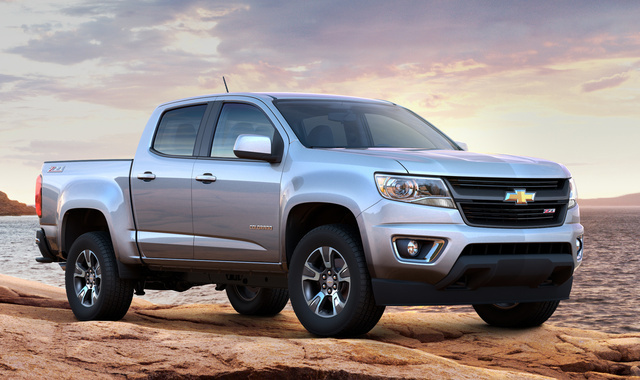 What's your take on the 2015 Chevrolet Colorado? Jim Bought a 2004 Colorado (Crew Cab, 4x4, Z71) new and now have 160,000 miles on it. No mechanical/drive-line issues, but the electrical issues (battery, switches, fuzes, radio, ignition phantom black-outs of different systems) are nearly overwhelming, with ghosts in the system that most times elude the best mechanics. 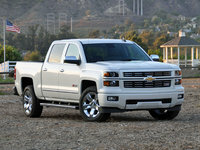 Love the size and utility, and if Chevy can fix the subpar electrical issues this might be my next choice. I'll give them a year of production and see if the electrical issues have gone away. migration_sldl2004 I just purchased my used 2010 Colorado, so by the time I get that paid for, maybe they'll have the bugs out of this new-gen model. Looks like a winner, but the 3.6L V6 doesn't have the torque that the 5.3L V8 in my truck has (320 ft/lbs vs 270). Maybe with all the bling that this model is supposed to have, it'll shut the whiney reviewers up that bashed the old Colorado. They'll probably still find fault with it since they seem to love the Japanese trucks. BPM1960 Form and Function rates a 9... really! Both the fuel and temperature gauges are completely obscured by the steering wheel when sitting in the vehicle. The only way to view them is to either peer under or over the wheel. Huge design flaw. 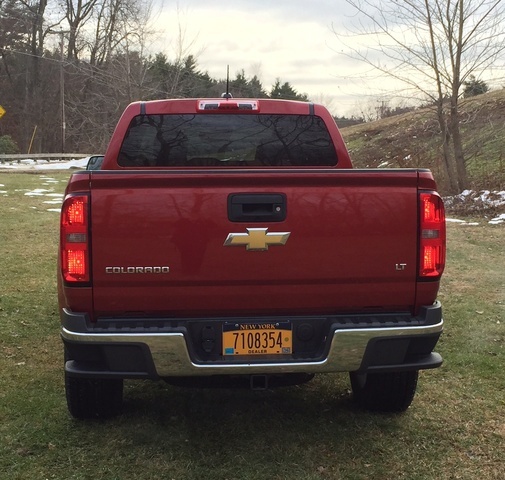 Users ranked 2015 Chevrolet Colorado against other cars which they drove/owned. Each ranking was based on 9 categories. Here is the summary of top rankings. 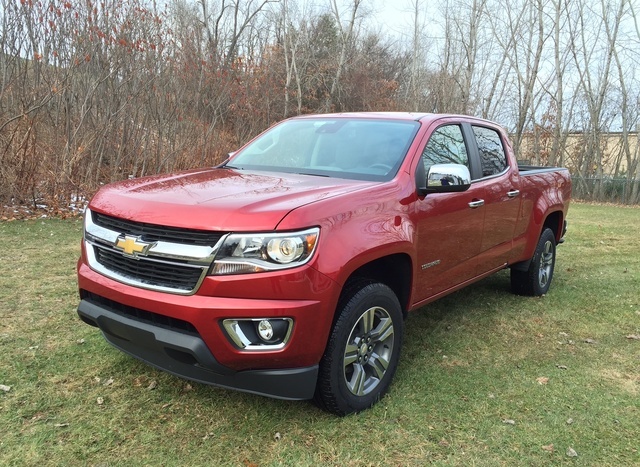 Have you driven a 2015 Chevrolet Colorado? How Many Miles Does A Chevy Colorado Last? I'm assuming this is grounds for a discount. It has Chevy generic alloys instead. Am I wrong to think that? If not, How much is a reasonable discount for something like this? Quirk Chevrolet told me that one is on order. No other info.